Hard-hitting Afrikaans drama. Presley Chweneyagae stars as the title character, a young delinquent who supports himself through a life of crime on the tough streets of Johannesburg. Coming from a brutal and deprived background, Tsotsi thinks nothing of committing acts of violence, but when he murders a woman to steal her car, he is forced to confront the consequences of his actions when he discovers the dead woman's baby on the back seat. Unsure what to do, he takes the child home and tries to care for it. As the baby gradually reawakens his buried sense of humanity, Tsotsi is forced to make a momentous decision when he comes across the child's bereaved family during a robbery. Hard-hitting Afrikaans drama. Presley Chweneyagae stars as the title character, a young delinquent who supports himself through a life of crime on the tough streets of Johannesburg. Coming from a brutal and deprived background, Tsotsi thinks nothing of committing acts of violence, but when he murders a woman to steal her car, he is forced to confront the consequences of his actions when he discovers the dead woman's baby on the back seat. Unsure what to do, he takes the child home and tries to care for it. 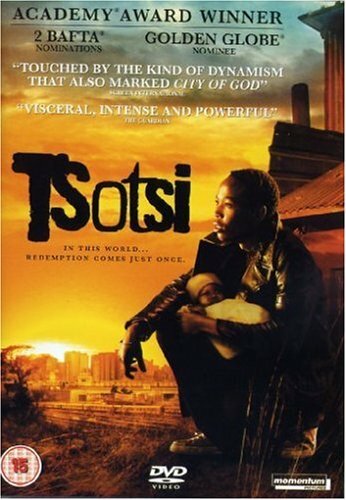 As the baby gradually reawakens his buried sense of humanity, Tsotsi is forced to make a momentous decision when he comes across the child's bereaved family during a robbery.